Currency paper has a unique feel and is extremely durable. Is it really 'paper' in the traditional sense? There are no wood fibers or starch in currency paper. Instead, like high quality stationery, currency paper is composed of a special blend of cotton and linen fibers. The strength comes from raw materials continuously refined until the special feel of the currency is achieved. People who handle money on a regular basis, such as bank tellers, can easily determine if a bill is counterfeit by this distinctive feel. The characteristic yellowish-green tint of U.S. currency is another distinctive feature which is, in fact, hard for color photocopiers to accurately match. Red and blue fibers have been a longtime ingredient of U.S. currency paper. Special features like these fibers are embedded in currency paper to ensure that reproduction is difficult. While some counterfeiters attempt to draw these fibers onto the surface of the bill, close inspection reveals the absence of the authentic embedded fiber and the clear presence of crude lines drawn on the surface. Security threads, which now run the width of the currency, are not a new invention. In some early versions of paper currency, thin security threads were added to paper. In these currencies, the number of threads in the paper represented a specific denomination. Security threads help prevent counterfeiters from raising notes—bleaching out the paper of a low denomination and printing a higher denomination onto the authentic paper. The new threads were first added to U.S. currency in 1990 and have recently been improved. In the redesigned notes, a security thread will appear in a different location depending on the denomination. The thread for the new $100 bill carries the words "USA 100" and can only be seen with transmitted light, which makes photocopying impossible. In addition, the new security threads glow red when held over ultraviolet light. For the 1996 series a watermark was added to the paper. This is also not a new invention. Watermarks were first used in the late thirteenth century in the handmade papers of Italy. They have long been used to mark important documents, and have appeared on a variety of foreign currency. Watermarks can also be found as part of any high quality stationery. Even Ben Franklin's stationery had its own personal watermark. The watermark is created during the paper making process and is caused by variations in the density of the paper. As light passes through these tiny variations in thickness, it creates different tones. 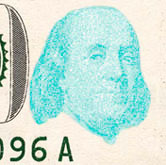 When held up to transmitted light these varying tones form a clear image—and in the case of the new $100, a second image of Ben Franklin.